From the Hancock County Courthouse, go north on Hwy 15/22 for 0.7 mile to Hwy 16 on left. Follow Hwy 16 for 6.1 miles to Hunt's Chapel Road. Turn left and go for 0.7 mile to stop sign. Turn right on Dickens Pond Road and go for 2.3 miles. 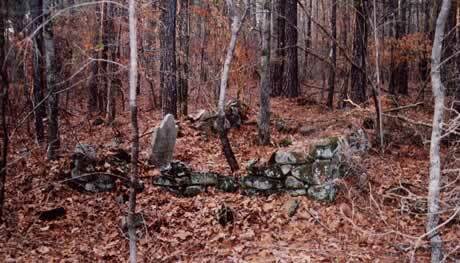 Enter iron gate on right and go for 0.4 mile to a clearing and then walk an additional 0.5 mile into woods to cemetery. Possibly a large slave cemetery outside the walled area. "Wife of Dr. D. Kendall". m. Jul 29, 1819, d/o John Brewer, Jr. & Mary "Polly" Mitchell Maiden name, parents, marr. date, per info & notes of Loula W. Kendall Rogers at Emory U. Many possible graves inside and outside walled area, some with rocks as headstones.